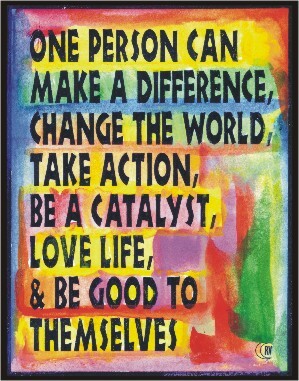 11x14 poster of What One Person Can Do, Raphaella Vaisseau's original, motivational quote for ONE PERSON. An anti-stereotype affirmation to aspire to, practice, and believe in. Words are powerful. What we affirm we can strive for until our believing makes it so. Be brave. Share your truth. Risk. Create new things. Make a difference. Take action. Love life.